Generate traffic – Whether it’s product exploration, gaming, competition or fun, custom interactive presentations help drive traffic to the booth. People seek out the unique experiences that interactives provide. 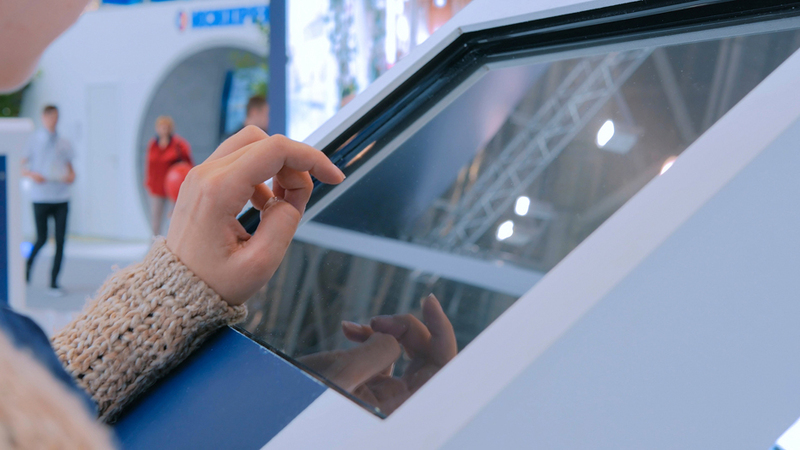 Increase engagement – Interactive trade show displays can draw visitors to your kiosk and increase engagement by providing a customized user experience for each individual. Features such as leader boards for games, collateral fulfillment or social media engagement can help to develop a memorable experience with your brand. Drive social interaction – Custom interactive kiosks can connect to and enhance your social media presence. Visitors to your kiosk can help spread the word and build brand awareness. Build teams – Competitive games can help drive traffic to your booth. Interactive stations can be developed for team building activities or to add some competitive play to your experience. Leader boards keep players aware of their position and awards and prizes keep visitors excited and engaged. Expand audience reach – interactive experiences can easily include multi-language support, ADA accommodations and can be customized for each unique trade show. Collect visitor data – Building analytics and form fields into your interactive kiosk provides valuable information on visitor’s interests, product knowledge, demographics and other data points that can assist with reaching your target market. Individualize a visitor’s experience – Custom touch-screen interactives provide unique experiences for each individual. Visitors choose what they want to view and how they interact with your information, providing a more valuable and personal experience. They also allow you to tell more complex stories. Connect to back-end systems – Your interactive kiosk can be an efficient communication vehicle by connecting to back-end systems for data collection or pull from common resource management systems. Last minute changes can be implemented minutes before a show.